5000K color of light is standard with high CRI of 90+. 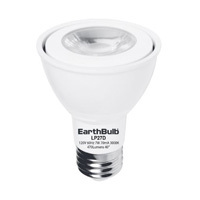 Great for use in dimming recessed lighting, track lighting and display lighting applications. High power LED and an advanced cooling system provides for 25,000 hours of LED life. Medium screw base. PAR20 can be used indoor or outdoor. 40 Degree beam angle provides a flood, not spot light. Capable of dimming to less than 5%. No mercury. Dimensions: 2.5”W x 3.35”T It is rated for wet location.